Pinterest continues to inspire me to be more creative around the house. 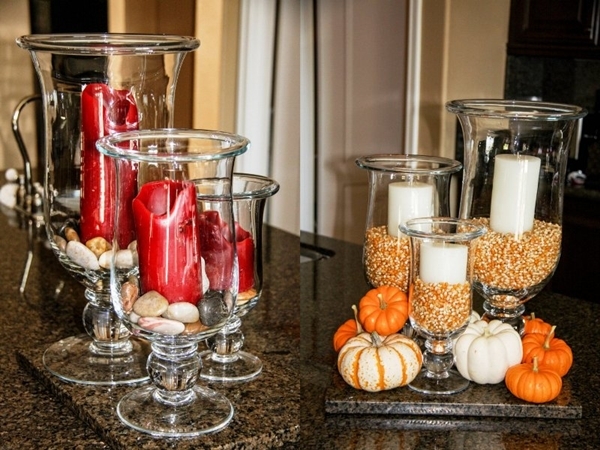 I decided to update the large candle display on my kitchen island for Fall and wanted something that would work for both Halloween and Thanksgiving (BEFORE is the picture on the left, AFTER is to the right). Originally I was going to use candy corn (better to decorate with than to EAT), but ultimately decided that corn would be the better and more natural choice. I am happy with my inexpensive display and appreciate that fact that once Christmas rolls around, I can remove the corn, pop it, and make popcorn garland for the tree. Since taking the picture above I put some Fall fabric under the pumpkins and it looks great. I am considering adding some of the gorgeous leaves from outside as well. I know what you mean. I cleaned out one of our big closets a few weeks ago and it seriously took me 5 days to do it…sheesh! It is all organized now, but I still want to do some more work on it to make it pretty.